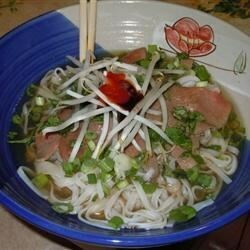 "This is a shortened and easier version of the delicious Vietnamese soup called Pho Bac. Garnish with pepper, green chiles, hoisin sauce, chili sauce and lime wedges." In a large pot over medium heat, bring beef shank and 3 quarts water to a boil. Skim off foam. Reduce heat, cover and simmer 4 hours. Preheat oven broiler. Place unpeeled whole onion under broiler until soft. Remove and peel. Stir onion, ginger, anise, salt and fish sauce into beef mixture. Bring a large pot of lightly salted water to a boil. Add rice noodles and cook for 8 to 10 minutes or until al dente; drain. Divide noodles into three serving bowls. Place cooked sirloin on top of pasta in bowls. Sprinkle green onions, bean sprouts and cilantro evenly in bowls. Strain beef broth and divide evenly between serving bowls, pouring over assembled ingredients. Serve at once. See how to make authentic Vietnamese pho. The nutrition data for this recipe includes the full amount of the broth ingredients. The actual amount of the broth ingredients consumed will vary. We have been to Vietman and had it from street vendors this recipe taste just like it does there. I would not change anything. The ginger should also be charboiled in the oven along with the onion to sweeten the flavor. In addition, it is missing some of the basic ingriendients in Pho such as peppercorns, cloves, etc. very very disappointed in lack of flavour.